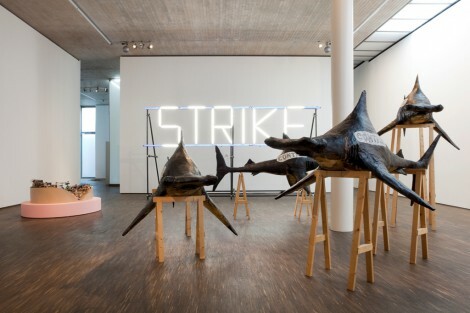 From October 1, 2011 to January 8, 2012 me Collectors Room Berlin is presenting the collection of Antoine de Galbert. Antoine de Galbert has been collecting contemporary art since 1987 with the conscious intent of circumventing the mainstream and certain trends. Folk art, “art brut” and religious objects complete his collection of contemporary works. An interest in motifs of transience and sexuality relate Antoine de Galbert to Essen-based collector Thomas Olbricht; it is in his exhibition venue in Berlin that parts of de Galbert’s collection are now being shown. Antoine de Galbert will be introducing his Berlin audience to works by artists living and working in France, providing an insight into the French art scene. Concurrent with the exhibition in Berlin, La Maison Rouge in Paris is in turn presenting Thomas Olbricht’s collection. In 2004, Antoine de Galbert opened his own exhibition venue—in parallel to his La Maison Rouge collection activities—where he has been showing three to twelve exhibitions a year ever since. Only rarely does he exhibit works from his own collection. Solo and group exhibitions alternate and are complemented by the presentation of one other private collection each year. A catalogue was published in conjunction with the exhibition by Kerber Verlag. Kindly supported by Institut français and Tip Berlin. In cooperation with la maison rouge. View here some selected press reviews about MY PARIS – Collection Antoine de Galbert.